Years ago, some artists would ‘borrow’ a riff from another artist, recreate it and sometimes get away without giving credit where it is due. Other times there would be a massive court case costing hundreds, if not thousands, of pounds or dollars. In the last 20 or so years that ‘borrowing’ is now commonplace and is referred to as sampling, where DJs, producers and rappers particularly would take a straight extract from another artist and use it in their own song. It probably gave them a better chance of a hit if the song contained something familiar. The most sampled musical artist is James Brown and the two most sampled voices are arguably Loleatta Holloway and Rochelle Fleming. Two names you may not be over familiar with but their voices you probably will be. Chicago-born Loleatta had three minor US disco hits in mid/late seventies but was then poached by various producers and artists to lend her vocals to their hits. One of the most famous was Dan Hartman’s 1978 original version of Relight My Fire which was later covered by Take That. In 1980 she recorded a song called Love Sensation which is probably her most sampled track and can be heard in many songs including, I Wanna Have Some Fun (Samantha Fox), Grand Piano (Mixmaster), Good Vibrations (Marky Mark & The Funky Bunch), Move (Moby) and Blind Faith (Chase & Status). The most well-known one was Black Box’s 1989 million seller Ride on Time, where the sample was used without permission and resulted in Loleatta getting paid out over 10 years later. As for Rochelle Fleming, she was the Philadelphia-born lead singer with the seventies group First Choice and a multitude of acts have used various sections of one of their non-charting songs, Let No Man Put Asunder. You can hear that in Jack Your Body (Steve ‘Silk’ Hurley), Thousand (Moby), Break of Dawn (Rhythm on the Loose), Can You Party (Royal House) and Too Blind to See (Kym Sims). 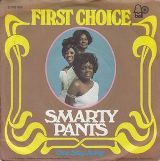 However, after all that, this week’s Single of the Week is Smarty Pants by First Choice. Rochelle Fleming and future First Choice member Annette Guest were part of a vocal quintet when they were both students at Overbrook High School in Philadelphia. They used to rehearse in Annette’s mum’s house and were soon doing the rounds of talent shows and public events. After contacting Georgie Woods, a radio DJ at WDAS, they were introduced to the soul producer and songwriter Norman Harris and the Delfonics’ manager Stan Watson. The full original line-up was completed when they added Wardell Piper, and Mulaney Star. In 1973, just before the recording of Smarty Pants, they signed a deal with Philly Groove records and Piper left and was replaced by Joyce Jones. For the bulk of their records, First Choice was backed by the tight rhythm section of guitarist (and co-writer) Harris, bassist Ron Baker, and drummer Earl Young, who were all part of MFSB, the house band for Gamble & Huff’s Philadelphia International Records.